El Pathos: "Hate & Love"
El Pathos' latest release titled Hate & Love is a solid rock record with large chunks of punk and blues influences thrown in, which guarantees a mass appeal to Austin’s legions of music fans. David Duet, the group’s front man, has a deep and gravely vocal range, which resembles Tom Waits, and Rob Buford plays catchy surf punk riffs that keeps the music appealing, while taking obvious influences from the punk guitarists of the 70’s and possibly the 90’s. The band’s musical roots go back to the 1980’s, where all five of its members have played in various Texas bands such as The Dicks, The Offenders, and Crotch Rot. While their paths would continue to cross at various times they would finally come together to form El Pathos in 2009. The first track on the album “Election Day” is a great intro track in which you could roll your windows down and roll up your sleeves, and remember why music is such a great form of artistic expression. The instrumentation on this track is great as well, features drums that are mid tempo and Duet’s Tom Waits like vocals. The second track titled “Into the Sun” has a surf punk feel, which resembles Green Day’s early days of somewhat sloppy punk rock with a lot of heart and passion thrown in. “Into The Sun” is a rock song that brings the vocals to the forefront of the song. While the structure of this song does not reinvent the wheel in modern music, Duet’s vocals are punk rock vocals at its best, with no range or beauty to be found, but are used more as a vehicle for the lyrics. Another track on the record “Of Days” sounds like an Iggy and the Stooges song. A dancy, predictable punk beat that with a big enough pulse to bring people out on the dance floor to mosh the night away. 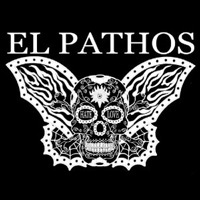 While El Pathos will not gain worldwide mass appeal, they will gain fans among the local rock and punk rock fans in the Austin area. It is clear from listening to Hate & Love that the band set out to record this record to have fun and entertain people who are looking for a good rock band that can play well and put on a good show.